To successfully design a class compliant USB audio device that works seamlessly with the Mac, it is important to understand the features of the Mac's USB audio class driver, AppleUSBAudio. This document explains the driver's architecture, features, and algorithms available in Mac OS X v10.6 and later. It also includes a section discussing recently enhanced support for devices that comply with the USB Device Class Definition for Audio Devices 2.0 specification. The insights and design tips presented here are intended to assist device developers in creating high quality plug-and-play USB audio devices. Note: There is often confusion when referencing the various USB related specifications. See Table 1 for a summary of the terms used in this article to reference USB specifications. Table 1 Terminology used in this document to reference USB related specifications. The reader is strongly encouraged to review the documents in Table 1. The AppleUSBAudio driver communicates to devices via the USB transport, using the IOUSBFamily APIs. AppleUSBAudio builds upon the IOAudioFamily layer which provides general audio driver functions like maintaining the sample and mix buffers, facilitating communication over the kernel and user space boundary through user clients, and more. Please see the Audio Device Driver Programming Guide for more details. AppleUSBAudio is a mature driver that supports many USB Audio 1.0 and 2.0 features. Table 2 highlights some of the supported features that are discussed in this article. Table 2 Supported features in AppleUSBAudio. A checkmark in the “USB Audio 1.0” column means that this feature is supported for USB Audio 1.0 devices. The same follows for the “USB Audio 2.0” column. Usually paired with an asynchronous input endpoint. Input adaptive endpoints are not supported. 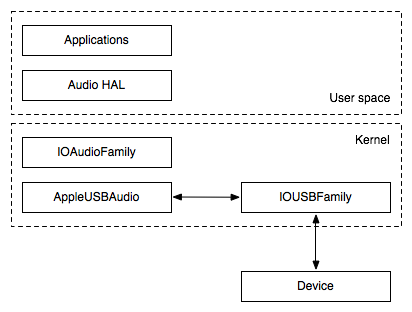 AppleUSBAudio represents the streams of a USB audio device to the application layer using IOAudioFamily's IOAudioStream entities. One or more streams are associated with each engine. In Mac OS v10.5.6 and earlier, AppleUSBAudio restricted each engine to one stream only. Then in v10.5.7, AppleUSBAudio’s engine model was redesigned to combine multiple streams per engine when possible. 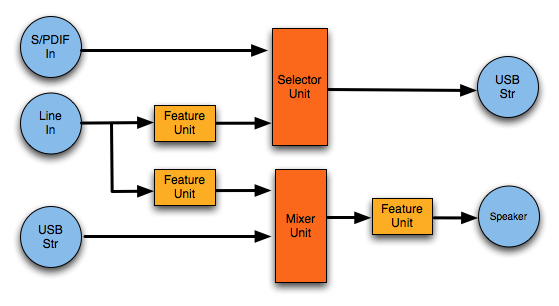 In cases where input and output streams can reside on the same engine, this architecture achieves sample synchronization and consistent latencies between streams. All sample rate sets must match. The same synchronization type is used for all interface alternate settings. The streams reside in the same clock domain. These streams cannot be activated independently. They will always start and stop together. The primary and most important function of the AppleUSBAudio driver is to support reliable, artifact-free audio streaming. Developers can aid the driver in achieving this goal by selecting the appropriate endpoint descriptor values for synchronization type and maximum packet size. To maintain glitch-free audio, AppleUSBAudio must regularly present timestamps to Core Audio that accurately represent the audio data rate of the engine (see “The Audio I/O Model Up Close” in the Audio Device Driver Programming Guide for more details.) When the device publishes the correct endpoint synchronization types in its configuration descriptors, AppleUSBAudio can pick the appropriate stream from which to generate the most accurate timestamps for the engine. Table 3 below lists synchronization type combinations that work well with Mac OS X. Table 3 Recommended endpoint synchronization type combinations. 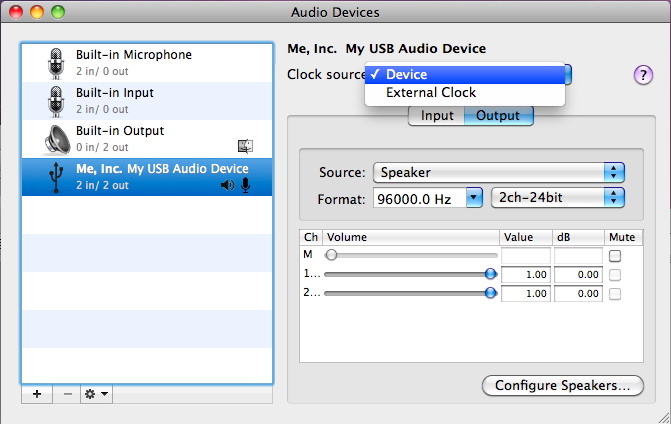 If a device supports multiple clock domains, USB Audio 2.0 clock entity descriptors should be used to clearly communicate its clock architecture to AppleUSBAudio. Please see the Clock Entities section later in this article for information about these descriptors. Note: Devices may use USB Audio 2.0 descriptors for full speed devices, not just high speed devices. This can be useful to more accurately describe full speed devices with complicated clock architectures such as multiple clock domains. The polling intervals (bInterval) for the stream endpoints must match. Table 4 illustrates the synchronization method used by the driver in various scenarios. If indicated by the “Usage type” field, the driver will treat the input stream as implicit feedback and ignore an additional sync feedback endpoint if present (Config 2.) This allows a device to implement both feedback mechanisms if needed for compatibility reasons. Config 3 is only recommended for USB Audio 1.0 devices where endpoint “Usage type” is not available. Table 4 Feedback used by AppleUSBAudio for asynchronous output under various configuration scenarios. Note: We recommend using implicit feedback when possible because it conserves both device and host resources, and increases feedback precision. It is very important to specify the correct value for each endpoint’s maximum packet size because an incorrect value could result in audio corruption. The packet size cannot exceed 1023 bytes for full speed devices and 1024 bytes for high speed devices (Section 5.6.3 of the USB 2.0 Specification.) To determine the exact value, one needs to identify the supported format and sample rate configuration that consumes the largest possible bandwidth for the endpoint. This value assumes that the data rate will never vary, as is the case when the stream is synchronous to SOF. If the endpoint is adaptive or asynchronous, one additional sample frame should be added to accommodate adjustments in the data rate. Section 2.3.1.1 of the Audio Data Formats 2.0 Specification limits variation in the packet size by +/- 1 sample frame. Packets cannot contain partial sample frames. So, while most packets will contain 44 sample frames, every tenth packet will contain 45 sample frames. *The extra permitted sample frame has already been included. Table 5 Summary of max packet size calculation examples. “Sync” indicates synchronous endpoints, “adapt” indicates adaptive endpoints, and “async” refers to asynchronous endpoints. When starting a stream, the driver reserves the minimum USB isochronous bandwidth possible: the minimum of the max packet size and the bandwidth required for the current sample rate and format. This maximizes the remaining available bandwidth for other USB devices, including other audio devices connected to the Mac. It also increases the likelihood that the bandwidth request will be granted in situations where much of the bandwidth is already in use. When streaming, devices must always observe the bandwidth restrictions for each of the sample rate and format settings. This includes the +/- 1 sample frame rule in Section 2.3.1.1 of the Audio Data Formats 2.0 Specification. Warning: Failure to comply with the bandwidth rules for the current sample rate and format may not only result in audio corruption for that particular stream, but for all of the other streams on the same engine. AppleUSBAudio parses the audio control interface descriptors to discover the audio topology for a USB audio device. The topology consists of building blocks or units that represent the audio function and provide a mechanism to manipulate parameters, like adjusting the audio controls. Figure 2 shows a simple topology that consists of Input and Output Terminals in blue, Feature Units in yellow, and a Selector Unit and a Mixer Unit in orange. AppleUSBAudio uses the information contained in the audio topology to find a device’s input and output volume/mute controls, hardware play through controls, input selector, and even clock source options for USB Audio 2.0 devices. AppleUSBAudio exposes these controls to Core Audio as IOAudioControls. This section focuses on volume, mute, and play through controls specifically. Feature Units contain volume and mute controls which can logically map to volume, mute, and hardware play through controls on the Mac. When AppleUSBAudio creates input and output stream volume and mute IOAudioControls, these appear in Sound Preferences and the Audio MIDI Setup (AMS) application. In the case of play through, a Feature Unit’s mute control appears as a “Thru” toggle in AMS only. The play through volume controls are also published by AppleUSBAudio but do not appear in AMS or the Sound Preferences pane. However, they can be accessed via the developer audio utility HALLab. Important: Since play through volume is not accessible to the user in AMS, developers should set the device's play through volume control default to a reasonable level to ensure a good user experience. * Volume/mute for input sources: AppleUSBAudio will publish the controls contained in the Feature Unit closest to the selector unit on the Input Terminal side as shown in Figure 3. 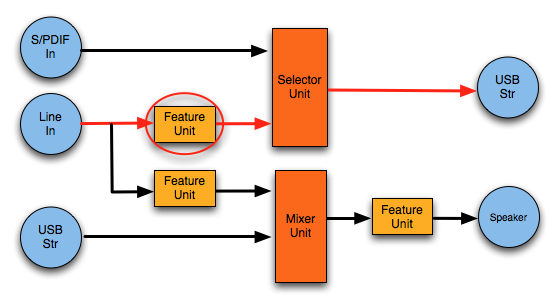 Figure 3 Feature unit selected for line input volume and mute controls. * Volume/mute for output sources: AppleUSBAudio will publish the controls contained in the Feature Unit closest to the Output Terminal as shown in Figure 4. Figure 4 Feature unit selected for speaker output volume and mute controls. * Hardware play through with Mixer Unit in path: AppleUSBAudio will publish controls contained in a Feature Unit between the Input Terminal and the Mixer Unit. Searching from the Input Terminal to the Mixer Unit, the driver selects the first Feature Unit that isn't shared with another audio path. An example is shown in Figure 5. Figure 5 Feature Unit selected for play through controls on a path that contains a Mixer Unit. Important: Play through controls cannot be shared with another audio path because this could result in unwanted side effects. For example, if a play through control is also contained in a record path, muting the play through control would also unintentionally mute the recording input. * Hardware play through without Mixer Unit in path: AppleUSBAudio will publish controls contained in the Feature Unit closest to the Input Terminal that isn't shared with another audio path. A status interrupt pipe can be used to inform the host that a setting has changed on the device. This feedback maintains synchronization between the Mac’s user interface and the device state. Currently, AppleUSBAudio updates certain audio controls on the Mac for interrupts originating from Feature, Selector and Clock units as described in Table 6. Table 6 Types of status interrupts that AppleUSBAudio supports and example device and Mac behavior. Please refer to Section 3.7.1.2 of the USB Audio 1.0 standard and Section 6 of the USB Audio 2.0 standard for more information. Another way to improve the user experience with a USB audio class device on Mac OS X is to provide meaningful and descriptive device and channel names. The following sections will explain how to accomplish this with the device’s configuration descriptors. The device name will appear in many places on the Mac, including in Audio MIDI Setup, Sound Preferences, and in third party audio applications. Core Audio represents each engine as a device in the system. If an engine has a name, Core Audio will use that as the device name, otherwise it will use the USB device name. 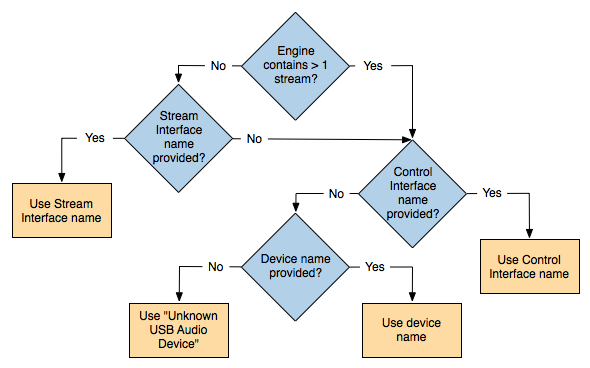 Figure 6 shows how AppleUSBAudio and Core Audio will determine the descriptive name assigned to the device, depending on the number of streams associated with the engine, and the presence of the control and stream interface names, and USB device name. Figure 6 Device naming algorithm. AppleUSBAudio supports the Audio Cluster Descriptors as described in section 3.7.2.3 “Audio Channel Cluster Format” of the USB Audio 1.0 specification and section 4.1 “Audio Channel Cluster Descriptor” in the USB Audio 2.0 specification. These descriptors allow device developers to name the channels in a stream, using either predefined names (such as “Front Left”, or “Low Frequency Effects”, etc.) or custom names. Listing 1 shows the descriptor fields of interest, as represented in AppleUSBAudio. Please refer to the USB Audio specification sections previously mentioned for a thorough explanation of the use of these fields. 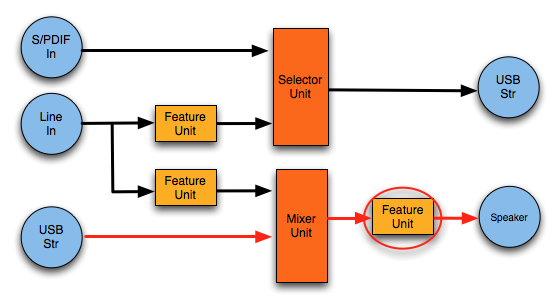 Audio Cluster Descriptors can be embedded in Input Terminal, Mixer, Processing, and Extension Unit descriptors. AppleUSBAudio searches for the Audio Cluster Descriptor on an audio path starting from the Output Terminal to the Input Terminal and uses the first one it finds. Mac OS X supports high speed streaming, up to 1024 bytes per microframe for each isochronous endpoint, including overhead. Note: The actual bandwidth available for endpoints depends on the current available bandwidth on the USB bus. For example, Snow Leopard (and later) is able to stream 10 channels of 32-bit audio at 192 kHz to and from a USB Audio 2.0 device. Additional information pertaining to isochronous data transfer can be found in the USB Device Interface Guide. Clock Domains are described using the new 2.0 Clock Entities: Clock Source, Clock Selector, and Clock Multiplier. The AppleUSBAudio driver also supports the associated clock related AudioControl Requests as specified in Sections 5.2.5.1 through 5.2.5.3. Unlike USB Audio 1.0 devices, the use of switching the Alternate Setting to control the sampling frequency is prohibited for USB Audio 2.0 devices. Instead, a Clock Source entity serves as the master clock for a clock domain, which can provide a sampling signal frequency. Clock Selectors enable both the host and the audio function to switch clock inputs. Figure 7 shows how a Clock Selector appears in AMS. The Clock Multiplier provides a mechanism to derive additional sampling frequencies within a clock domain that are synchronous to the input clock signal. Figure 7 Clock Selector as it appears in Audio MIDI Setup. In this case, the Clock Selector allows the user to select between the device and external clock sources. AppleUSBAudio contains additional support for parsing the Interrupt Data Message Format in Section 6.1. The only additional 2.0 status interrupt support added to the driver was for the Clock Source unit. AppleUSBAudio responds in various ways to an interrupt generated from a Clock Source unit that is currently driving the data rate. If the clock validity bit indicates the clock is invalid and the audio topology contains a Clock Selector, the driver searches for an alternate valid Clock Source and switches to that (as described in Table 6.) If the Clock Source is valid, then it assumes the sample rate has changed. In this case, it republishes the available rates and updates the current device sample rate on the host. AppleUSBAudio was designed to allow for some vendor specific extensions. This gives developers the advantage of adding special features without having to maintain the basic feature set of a high performance audio driver. One way to augment the behavior of the class driver is to provide a codeless kernel extension (kext) that overrides certain properties of a USB audio device. These properties include the USB device and interface names, localization bundle, Core Audio HAL plugin, providing access to a custom control panel via Audio MIDI Setup's "Configure device..." option and more. This sample code illustrates the various properties that can be modified. Another way to customize AppleUSBAudio is to add vendor specified DSP processing to input and/or output audio streams. Developers can create a custom USB audio plugin that performs audio signal processing only for their device. This mechanism can also be used to provide access to a custom control panel. In the initialization routine, call super::pluginSetConfigurationApp() with the control panel's application bundle ID. Updated to include integrating a custom control application from a codeless override kext. Updated with a new section describing feedback mechanisms for asynchronous output streams, including implicit feedback. Made minor editorial corrections. New document that details Apple's support for USB audio to help developers design class compliant devices that work seamlessly with the Mac.